First off, this dinner, especially if I had left out the brown rice, which takes about an hour (!) to cook, is definitely a weeknight meal. Even with the rice, I was able to go from start to finish in exactly an hour. Without the rice, I don’t think it would have been any trouble to meet or beat the 40 minute cook time estimate noted in the recipe. Since it took the longest time to prepare, I started the rice first. I knew that if I kept the lid on the rice, as the last step in the cooking directions say to do, I could keep it warm for a while if it was done before the fish (the last thing to be cooked) was ready to be plated. As is my preference, I prepped everything before starting to cook. As I’ve noted in earlier posts, this can take a little longer, as you can’t take advantage of the fact that you can prep some things while other things are cooking, but I find it easier to work this way. This recipe lends itself to this prep-in-advance-approach, because the ingredients for the compote go into the pan in two batches. First, you cook the onion, garlic, jalapeno, and celery for about 4 minutes, and then you add the tomatoes, olives, and capers and cook for another 2 minutes. A this point, you remove the pan from the heat, stir in the lemon juice and parsley, and cover the pan to keep everything warm. Cooking the bluefish couldn’t be any easier: you brush it with olive oil, sprinkle it with salt and pepper, and put it under the broiler for about 5 minutes. Though you could probably pull it off, I wouldn’t recommend trying to cook the fish and make the compote at the same time, for two reasons. One, I think letting the compote sit, even for the five or so minutes while the bluefish broils, helps the flavors combine. Two, at least in my experience, leaving food under the broiler even somewhat unattended is usually a bad idea. 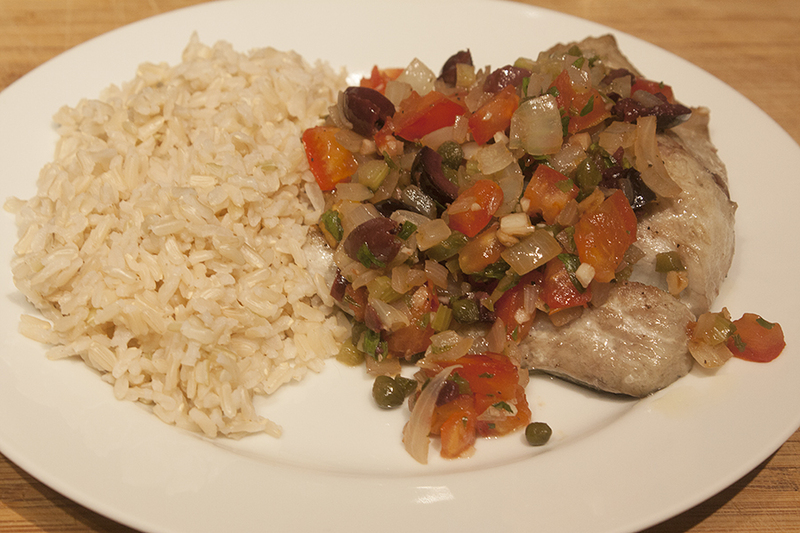 The fish was cooked perfectly – a little crispy on top and cooked all the way through, but not overdone. The compote was a nice pairing, as the briny, salty ingredients (capers and olives) complement the fish, while the other ingredients, especially the tomato and onion, provide a nice counterpoint. (We must have gotten a dud jalapeño, because there wasn’t much heat to speak of in this dish, which was fine.) As we noted in the menu write up, Michael at Columbus Wine & Spirits suggested an Italian white for this dish, a 2013 Feudi di San Gregorio Greco di Tufo. The wine and fish went together quite well, making for a lovely weeknight dinner.